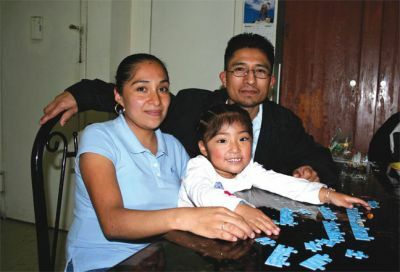 When Ricardo Ramón and Natalia Evangelista immigrated to th United States from Santa Inez, a small, arid farming town in the southern Mexican state of Puebla, they didn’t imagine that they would be fighting displacement again. “We have the same problems we left in Mexico,” said Ramon. “There, they fight for a place to live. Here, we do the same.”Ramón, 25, and Evangelista, 23, are just two of about 380 tenants, organized with the Movement for Justice in El Barrio (MJB), who are fighting off efforts by their new landlord to evict tenants from 47 rent-stabilized and rent-controlled buildings in East Harlem, also known as El Barrio.Since the 47 buildings were bought by Dawnay, Day Group, a privately owned British bank that manages $10 billion in worldwide assets and has real-estate holdings in Europe, India and Australia, tenants have faced widespread harassment and have been falsely charged for services that they never received. One of numerous foreign investors who have been recently attracted to the New York City real-estate market, Dawnay, Day spent close to $250 million in March on buildings north and east of Central Park from East 100th to East 120th streets, containing 1,137 apartments and 55 commercial spaces.East Harlem, called El Barrio by many of its 100,000 residents, is a historically Puerto Rican neighborhood that has recently experienced a large influx of Mexican, Chinese and Arab immigrants. Nearly 40 percent of its residents live below the poverty line. The median household income in 2005 was only $23,000 per year, less than half of the $50,000 figure for all of Manhattan. The median rent was $900 a month — 47 percent of the median income. Dawnay, Day’s objectives were clear: Push out the current rent-regulated tenants, renovate the buildings and raise rents. “East Harlem is the last area of the whole of Manhattan being gentrified,” Phil Blakely, Dawnay, Day’s director, speculated in The Times (London). He likened purchasing property in East Harlem to buying real estate in Brixton, a London neighborhood — once the heart of the city’s Afro-Caribbean immigrant culture — whose recent gentrification has led to sharp rent increases. “A typical two-bedroom flat taking $150 per month in rent can see the rents rise 3 percent to 4 percent each year without doing anything,” Blakely told The Times (London). “As soon as you take vacant possession, the rents will typically rise 17 percent when re-let without doing anything. But with renovation, a flat could well take $1,700 a month once re-let on the open market.” He estimated that once the East Harlem apartments were renovated and rented at market rates, the value of the properties would increase from the purchase price of $280 per square foot to more than $1,000 per square foot. Zoila Jara, a single mother of two who has lived on East 106th Street for 13 years, says the company falsely charged her for $1,495. “Dawnay Day claims that some of this is for a washer they say they gave me. The fact is I do not have and never had a washer,” she said. “On top of this, for every month that goes by that I refuse to pay, they add false late fees.” The company has also refused to make much-needed emergency repairs, according to an August article published by the Daily News. Tenant Cristina Ortega reported two separate incidents in which Dawnay, Day failed to do repairs after pieces of her ceiling fell, injuring her two teenage daughters. “I notified HPD,” she told the News. “They have done nothing.” Residents been subject to accusations of overcrowding apartments, asked to pay imaginary legal fees Dawnay, Day has claimed are owed to the former landlord and been offered money to leave. Tenants say that Stephen Kessner, the previous landlord of the 47 buildings, used similar tactics. But instead, they evicted him from East Harlem. Fed up with the dilapidated conditions of their apartments, Ramón, Evangelista and other tenants organized and brought Kessner to Housing Court.“When one person goes to Housing Court alone it doesn’t work. Having many people in court together is what carried the day,” said Evangelista. “When a judge sees a group of tenants together fighting, he is more likely to respond than when he sees you alone,” added Ramón. MJB’s campaign against Kessner garnered much press attention — the Village Voice labeled him one of “NYC’s 10 Worst Landlords” in July 2006 — and eventually forced him to put his East Harlem properties on the market. Dawnay, Day bought them in March. “We think [they’re] part of a scheme to harass the tenants to get them to move out so they can raise the rents on the vacant apartments.” Juan Haro, an organizer and co-founder of MJB, accuses the city Department of Housing Preservation and Development of selective inaction. “HPD says their stated goal is to ensure that tenants are protected, since tenants do have legal rights, but the truth of the matter is when tenants in East Harlem call 311, HPD turns a blind eye, HPD doesn’t respond as they would if these tenants were white, middle-class, upper-class residents such as those that live in midtown Manhattan.” He says that they are fighting not just greedy landlords, but the larger capitalist system and its globalized tentacles — “our objectification by these multinational companies, by these landlords, by the city, by HPD in its attempt once again to displace us so that we are forced to leave East Harlem and live elsewhere.” “They want to remove from the street the street vendors who earn an honorable and dignified living, the families that have their small restaurants, small clothing stores, and the small bodegas on the corners in our neighborhood,” MJB said in a statement.